Ownership in 1861 comes from the 1861 census and agricultural census. Down the road to the left at 93 de la Rivière is the stone Payne house, 1860s (after 1861). The road now passes through the Luskville flats, fertile farm land on either side, deposited when the Champlain Sea covered the area between 12,000 and 9,500 BC. When the glaciers retreated the land rose and the Ottawa River and its tributaries built up a network of furrowed terraces, and created zones where landslides and erosion occur. These terraces are visible to the right, in front of the higher Gatineau Hills. Terraces can be seen between Fort Coulonge and Montebello, but are particularly well developed in Luskville. 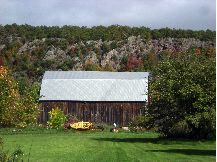 The Gilmour Findlay farm (#1802) is on the right, at the edge of the first terrace, with the Eardley Escarpment behind. The farmhouse has belonged to the Findlay family since the 1850s. The highway bears left and climbs the terrace. At the top of the terrace on the right is #1826, the Brady farmhouse, an olive-green one-and-a-half-storey, ca. 1860 (c. 1870, IPBRO). It was later owned by Thomas and William Lapointe. In the 1930s four teams of horses were needed to haul the threshing machine up Willys Hill. On the right side of the road is a c. 1920 barn at #1829. #1849, white one-and-a-half storey farmhouse with grey roof. Owned by Ivan Lusk. John Lapointe lives here. 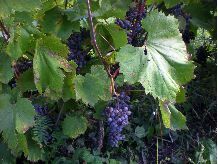 Domaine de la Campagne is at the junction of Montagne with the highway. This is the new location for Au Charme de la Campagne, which was in Aylmer for many years, well-known for country furniture and crafts, gifts, and kitchen stuff. After the junction with ch. de la Montagne, the road drops down, over Brady Creek, and up and to the right past a small white church with a square tower, the Centre Eardley Methodist Church (now United) and cemetery. This was used from 1877, replacing an earlier church. Many of the pioneer families names can be found on the gravestones. After the church is a short commercial strip with Dépanneur Poirier (#1866) and small restaurants: Le Spot (#1862) and Le Restaurant Bienvenue (#1865). One or two properties are eyesores. This village or hamlet is called Heyworth on official maps, after the Hayworth family. John Hayworth (1791-1879) came from Yorkshire, England. His wife, Isabella Thomson (1796-1855) was born in Roxburghshire, Scotland. #1862 is an attractive house with a green roof curving to form a veranda. After Heyworth the divided highway starts and continues for 5 km  the four-lane. The first farm on the left at #1913 is Avant-Garde Equestrian Farm. On the right behind the pine trees is a stone house with a red roof. Further along the divided highway (#2024) is the Luskville Town Hall, built in 1877. It is red Luskville brick decorated with white marl brick from MacKay Lake near Rockcliffe Park. The photo taken in November 2011 shows the completed new extension to the right of the 1877 building, with the brick facade recently restored, revealing the warm colour of the brick and the upper row of decorative white brick, which had previously been painted over with the words Hotel de Ville. Since then a sign saying Hotel de Ville has been added to the new part, maintaining the bilingualism. Across the highway at #2019 is another one-and-a-half storey farmhouse, originally Joseph Lusk Jrs farm. Just past the Town Hall is a right turn, signposted to Gatineau Park. Chemin Hôtel-de-ville (unpaved), will take you to the Luskville Falls parking lot. From here you can walk up a short, steep path to the Falls, and the Lusk lookout (photo shows the view to the south). The waterfall is spectacular in the spring. If you have lots of time you can continue up the steep trail to a second lookout (Pontiac) and the fire tower. This is the beginning of Gatineau Park trail number one, Ridge Road, which leads to Old Chelsea. From the lookouts and the fire tower you can see a wide expanse of the Ottawa Valley. The fire tower was used to detect forest fires in the early 20th century. A horse riding trail goes from near the parking lot and leads west along the edge of Gatineau Park and the escarpment to Eardley-Masham Road. The section between the Luskville Falls parking lot and ch Pilon needs work (it is closed), but the trail is open to members, from Pilon, across the Eardley-Masham road, ending on Steele Line. See website at http://www.pontiacequestre.com/ for more information. Ch. Pilon is on the right before you reach the recreation park, see map above. Alexandre Bélisle was the owner of the farm nearby when the land was taken over by the Federal District Commission (now NCC). The farmland became Luskville Falls Park. The barn at 300 ch de Hôtel de Ville was built about 1920 (IPBRO). Turn left from the highway just after the Town Hall. You will be on a loop of the old highway 8 that passes through Luskville village (ch. du Village). On the right at #130 is the former Breckenridge station building which was moved here in the 1980s. On the left you will pass an old cheese factory, now painted green. On the right at #72 is a tiny house, the former post office, (c. 1870, IPBRO). Continuing on Ch du Village, #71 is a beautiful small squared log house with later addition. It is said to be built about 1870 (1845, IPBRO), and lived in by Hormidas (Midas) Perrier (1885-1954) and Maria Lusignan (1893-1985). Unusually it is built of ash logs, not white pine. In the 1861 census the 200 acre lot where 71 chemin du Village is located, (Range 9, lot 15, Eardley township), was owned by Charles Gibson (age 47) and Maria Foy (37), who lived in a 1 storey log house with 7 children aged from 3 to 15. So 1845 is about right if they built the house on marriage. The farm seems quite prosperous on the 1861 agricultural return, which also suggests they'd been there a few years, perhaps since 1845. Across the road #70 is the house that was Michael McCaffreys home and blacksmiths shop, built about 1880 (c. 1900, IPBRO). Joe McCaffrey was the last smith. He closed the smithy in 1948. The house is still owned by the McCaffrey family. On the left just before the road rejoins the highway is St. Dominiques Catholic Church, a stone church built in 1884 using stone from the mountain behind the McLean house #3232. The red brick priests house next to the church was built by 1895. There are two cemeteries, the old (c. 1880, IPBRO), across from the church (right hand photo), and the new next to the church. Back on the highway there is a small commercial section with (?) Levesques gas station and auto repair, Marché du Centre for groceries, a Caisse Populaire and Bar au Coin des Sportifs. 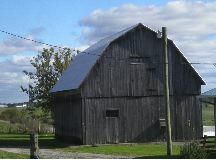 On the right is a plank barn in good repair, #3060. On the right is a red brick house, near the turn to Pilon. In the 1930s and 40s the property belonged to Robert McMullen. Laurie Erwin writes: I used to vacation at the Stuart McLean farm next door [#3232]. Robert's wife was Ellen Craig and her sister, Rachel (Myssie) Craig was married to Stuart. When her parents died, the McMullen property passed to their only child, Violet, who had married Allan Poole and lived farther west in Onslow. In the summer, the house is almost hidden now by tall lilac bushes. Right hand photo, Laurie Erwin. Continuing west on the highway, just over 2 km from the end of the four-lane highway you may turn left on ch. Alary to find Daniel Alarys Érablière Riveraine, for maple syrup treats in spring, and a farm museum year-round. (Phone 455-2249). Continuing on the highway you pass Luskvilles Recreation Park operated by Eardley RA for the municipality of Pontiac (on the right). There is a popular skating rink here, baseball diamonds, soccer pitches, toilets, and telephones. On the right at #3228 is a c. 1920 barn (IPBRO). Close by on the right at #3232 is a large stone house built in 1893/4 by Archibald McLean (1848-1942). Archie possibly built the house with the proceeds from a silver mining venture in Montana in 1891-3. He was the youngest (12th) child of Captain Donald Charles McLean (1786-1873) and his wife Ann Warren (1803-1865). He bought the farm land in 1881. Captain D.C. McLean (1786-1873), his father, was well known for having walked on snowshoes from Moose Factory to Montreal in early 1816, as one of a party of four Hudson Bay Company men, led by George Gladman Sr., to deliver mail. He settled in Eardley in the 1850s and was the enumerator for the 1861 census for Eardley district 2, writing that he was 76, living in a one-and-a-half storey log house with his wife, 56, and four sons: Wm. H., 29, Laughlin, 17, Bowden, 16, and Archibald, 14, on the 200 acre McLean farm south of the highway and west of Parker road, which they purchased in about 1846. Another of D.C.s sons, Hector Mayne McLean (1839-1908), was mayor of Eardley for 17 years and warden of Ottawa county for five years. At the time of the 1861 census he was 22, and visiting from Mansfield. Before 1890 he bought the flour mills in Quyon, selling them to the Dowd Milling Company in 1897. The DC McLean family donated land for St. Lukes Church and cemetery (coming up on the right) from a part of lot 25 range 10. This land was on the other side of the highway from the rest of the farm. Le Ranch de lOutaouais at #3239 sells eggs, and runs a sugar shack north of the highway in maple syrup season. On the left is a tiny white chapel, built in 1866, the Zion Methodist Church (now United), and cemetery. This was also known as the Upper Eardley Methodist Church. It is built of handhewn logs, and was renovated in 1952. According to LAutre Outaouais, page 158, the original road ran on the other side of the church, which has its back to the present highway. It is one of the five oldest protestant churches in West Québec, along with the Centre Eardley church. On the right, high on a cliff above the highway is St. Lukes Anglican Church, 1873 and cemetery. The main part of the church is built of logs. This church was called the beacon on the hill. The road to the left here is Parker. There was a railway station near where the railway line crosses the road (about one km down Parker). 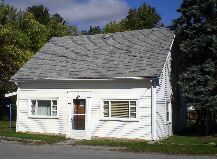 Gail, June and Kent McConnell lived in the Old Parker Station, built about 1886, as their father, Railroad Bill William McConnell was the section foreman. The building has been moved to the shore of the Ottawa river at the end of Parker, one kilometre beyond the old rail-line, and restored by Edith and Roy Nugent. In 2012 it is the best preserved station building in West Québec (LAutre Outaouais). 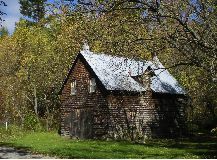 On the left at #3297 is a log house, built in 1978 in Hull by several Pontiac residents including Armand Ducharme and Paulette Lamoureux, as a demonstration project (left hand photo), and later moved here. Unfortunately for passersby, it was placed with its back to the highway, the original shingle roof has been replaced with a smaller tin roof, and the log structure is hidden by an addition at the front. At the junction with the Eardley-Masham road #3329 is Dépanneur K-R in an unusual brick building (c. 1900, IPBRO). There is an artists studio in an old cheese factory down Curley Road on the left (237 ch Curley, c. 1890, IPBRO). The Eardley-Masham road, to the right, leads into Gatineau Park. The road is only paved until the park entrance. There is a beautiful picnic site at Church Hill Falls, on the right just inside the park entrance. #3341 Bonshor Dowe, one-and-a-half storey farmhouse and barns. Continuing on highway 148 west, on the left just before Kennedy Road is a large red brick house, #3361, owned by Ivan Merrifield and his wife Mary Hickey (c. 1920, IPBRO). Ivan Merrifield was the son of Freeman Merrifield and Matilda Goodfellow and died in 2000. There are several similar red brick houses on Kennedy Rd., all built about 1913, including the Kennedy homestead at 2461 Kennedy (south, towards river), now owned by the Labelle family, who found pennies and newspaper clippings dated 1913 in the walls when they renovated in 1991. Before 1950 there was a school on Kennedy at the foot of the hill (Muldoon/Kennedy school area). North on Kennedy at 2590 Kennedy Rd, is the Dowd homestead, which through marriage is now the Nugent homestead, a one-and-a-half-storey gem. Kennedy Road was the dividing line between Eardley and Onslow Townships. The highway now enters Onslow.